I have always preferred white porcelain dinnerware to give my table that elegant and sophisticated look, and now that I have discovered the ‘Loft’ range, manufactured by Thomas – Rosenthal, I do not need to search any further. “Thomas – The Trend Factory” has been a byword for modern, stylish, uncomplicated design for 100 years appealing to a young, ambitious customer group, always looking for a new approach whilst maintaining the highest quality. Today, the Thomas range is produced at the Thomas and Rosenthal factories situated in Bavaria, Germany. 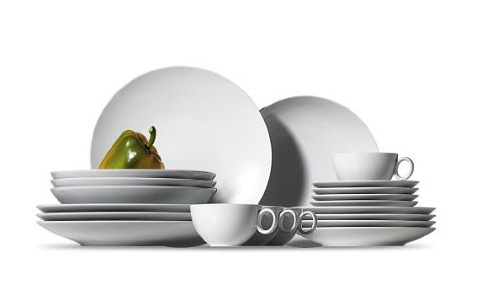 All the tableware is flame-retardant, heat-resistant, dishwasher-proof and microwave-proof. Of course it is also “from oven to table” as one expects today. The porcelain tableware is elegantly minimal and has a subtle pattern of fine, slightly raised white lines that form concentric circles or squares, depending upon the shape of the piece. Shapes are mixed and matched – round, oval, square and rectangular, creating a highly unique arrangement on the table. There are nearly sixty different items available in the range including plates, bowls, dishes, jugs, cups and saucers and even a Chinese style soup spoon. They can be purchased individually and as you require and so it is possible to build up a set of dinnerware suitable for any menu and to match your personal decor. So, when I set my table for my next house party, I do not have to worry about the elegant presentation created by my beautiful ‘Loft’ porcelain dinnerware but only to be sure that my cooking is up to the same standard.